If there were an evolutionary chart for automobiles, these vehicles would be pretty close to the beginning. Call them the Cro-Magnon men of cars...if you will. 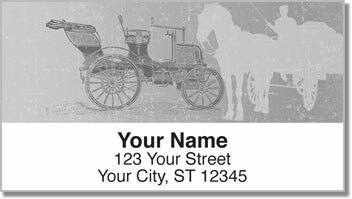 You can see how transportation slowly changed from the horse-drawn carriage to more familiar machines. Today there are more than 800-million cars and trucks on the road around the world. 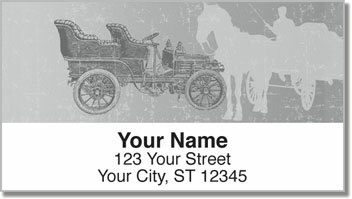 We've come a long way since the introduction of the motorcars pictured on these address labels. 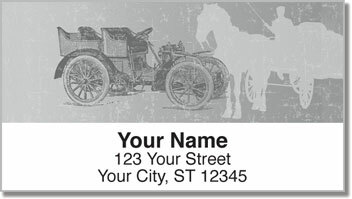 This design will give your outgoing mail a classic look. It's a great choice for history buffs and collectors. What you'll really love is how convenient this product can be. Save time thanks to a self-adhesive backing that lets you simply peel and place your return address on all that outgoing mail. Scribbling out your name and address by hand is just...old fashioned. 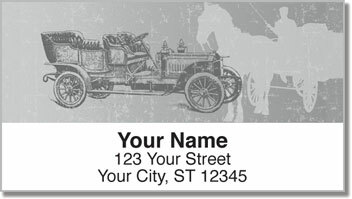 Get your own Antique Automobile Address Labels right now! Order them with a set of matching checks.